Do you remember the Crosby Stills and Nash song from the 70’s called “Our House”? When I was growing up, for some reason that song epitomized my idea of the perfect home and relationship, all the way down to the “two cats in the yard.” For a good part of my life, I was a real “cat person” and letting my cats wander around outside just seemed natural. Then, one of my favorite cats came home poisoned. The vet thought she had ingested transmission fluid and we assumed that it was an accidental ingestion (certainly, no one would have poisoned her on purpose) and we paid the exorbitant vet fees and she got better. Another time, she ate a poison lizard and almost died. Again, we paid the fee and the vet fixed her up. She finally died from being hit by a car. There was no fixing her up that time. Eventually, I quit letting my pet cats roam outside. After that, my tolerance towards other people’s roaming pets changed pretty quickly. I’ve had my screened patio torn up by free-roaming cats. I’ve been chased indoors by mean, snarling dogs. And I often step in both dog and cat poo, because I assume that I shouldn’t have to look out for it on my own, petless property. But now that I garden for wildlife, my biggest problem with free roaming pets is that they chase, maim and kill birds, rabbits and other forms of wildlife that visit my yard. In my mind, there are many reasons to NOT let domesticate animals roam free in neighborhoods, including possible harm to both the pets and wildlife and inconvenience or property damage to fellow homeowners. (As a gardener, there are few things as unpleasant as running your fingers through your beautiful soil and finding a pile of newly deposited cat poop). But since this is an eco-friendly garden blog, I have decided to focus this message on pets and pesticides (and other garden chemicals). Let’s face it. If there is a chemical on the ground, it is very likely that it will end up inside of a pet. 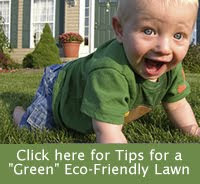 Cats and dogs walk and sit on chemically treated lawns and gardens and then lick their paws and.….sitting areas. They also dig in chemically treated soil, eat plants and kill and eat birds and rodents which have ingested posions. And even if you don’t use chemicals in your own yard, letting your pet roam free can subject them to the chemicals found in the yards of your neighbors. So whether you are a gardener, trying to decide if you want to keep using chemicals in your landscape or a pet owner who allows your pet to go on the occasional (or frequent) unsupervised romp around the neighborhood, here are some facts about Pets and Pesticides. Although many of these facts specifically mention dogs, keep in mind that pesticides that are toxic to dogs will have adverse effects in cats also, due to their more delicate digestive system. A study published in 1995 in the academic journal Environmental Research shows a “statistcally significant” increase in the risk of canine malignant lymphoma in dogs when exposed to herbicides, particularly 2,4-D, commonly used on lawns and in “weed and feed” products. One product of particular concern is snail bait. A common ac­tive ingredient, metaldehyde, is tasty and attractive to mammals. Unfortunately, it is also highly toxic to all mammals, and causes blindness, excessive salivation, seizures, and sudden death. A study by Purdue University found that Scottish Terriers ex­posed to pesticide-treated lawns and gardens are more likely to develop transitional cell carcinoma of the bladder, a type of can­cer. Avermectin B1: An insecticide used for fire ants, causes leth­argy and tremors in dogs. Allethrin: Used on flies and mosquitoes, has been linked to liver cancer in dogs. DCPA: An herbicide used in lawns and gardens, is suspected to cause adverse effects in the liver of dogs. Dogs and cats use their noses to poke around and explore. The nose is a mucous membrane and an easy place for pesticides to enter their bodies. Dogs, in particular, absorb pesticide residues by chewing or eat­ing plant material that was treated with pesticides. Cats absorb more chemicals than dogs due to their grooming habits. Because cats are specialist carnivores, they lack certain en­zymes in their liver that decontaminate chemicals, making them especially vulnerable to the effects of toxic chemicals. Cats and dogs hunt, and it is natural for hunters to pick the weakened animals as prey. Animals that have been poisoned are easy targets for predators because they are easier to catch. Symptoms of secondary poisoning may not occur for weeks after a dog or cat eats a poisoned animal, and may not be recog­nized as such. The topic of free-roaming pets, or cats in particular, is a touchy one with strong opinions on both sides of the issue. But no matter what your opinion is, the fact is that chemicals in the landscape can be harmful – to pets, to people and to the environment. The best answer for most of us is to learn to get by with fewer chemicals. We can spot treat weeds or pull them by hand and learn to attract ladybugs and other beneficial insects.